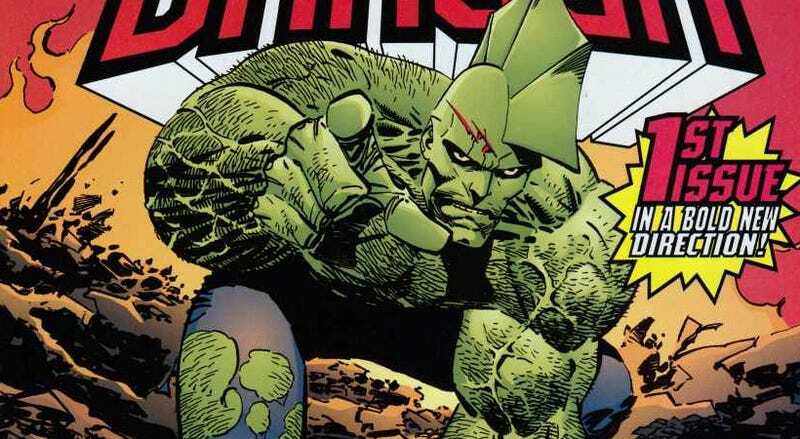 Erik Larsen's cult-favorite Savage Dragon comic could be headed for the big screen, despite the odds being stacked against it. Here's why Savage Dragon: The Movie is the film fans deserve and the film fans need. Now, this is just a script which means a) Erik Larsen is seriously interested in a Savage Dragon movie, and b) he intends to remain heavily involved with the project. It does not mean, however, that the movie will get made any time soon. Conventional wisdom says this will never happen. It's a property little-known outside of the comics field and not as well-read as it deserves to be within the comics field. It's a comic without a clear status quo. On the surface, it looks a lot like other properties. And, perhaps most damning, industry watchers keep expecting superhero fatigue to hit any movie now. The thing is, Savage Dragon: The Movie is the superhero flick that must happen. The only Image Comics founder still writing and drawing his launch title, Larsen has gone on record saying he continues to create comics because it's fun - and the fun bleeds through to the page. The aesthetic of Savage Dragon could probably be described as Hellboy-meets-Pacific Rim filtered through Jack Kirby on acid. Monsters and superheroes mix on a regular basis in this comic, but it's presented with a sort of mock epicness, as the city-sized demons and planet-devouring space gods are rarely the main story. At best they are a quick (and aggravating) annoyance for the main character, and at worst they are the punchline of a disturbing joke. Hell, the comic's most popular antagonist is an insanely strong flying chicken man. By not taking the seemingly major events seriously, the comic allows readers to better connect with the characters while enjoying the craziness that made comics fun in the first place. When Spider-Man premiered, he was a student who had a doddering old aunt and relationship problems. Two decades later, he was in the exact same situation. Then he got married, then his aunt died. Two decades later, he was a student who had a doddering old aunt and relationship problems. Sure, Peter Parker has finally graduated college, but give him time, he'll go back for his second doctorate. The Dragon has never had the same handicap. Sure, readers who only read the first few dozen issues or watched the short-lived cartoon may think of Dragon is a Chicago cop trying to take down superpowered gangsters led by a Godfather-wannabe in an Iron Man suit. Thing is, that was only Dragon's life for a brief while. He eventually fathered a child (who soon disappeared), left the force, joined a government agency, became a dimension-hopping hero, married a single mother, became a widower and single father, found his long-lost biological son, became a world-conquering villain, died a few times, came back a few times, got arrested and sent to death row, lost his powers and was replaced as the star of his book by his now adult biological son. See, Savage Dragon is a comic that is published in real time. That means 22 years have passed since the Dragon first woke up in a burning Chicago field and joined the police. Imagine if Marvel Comics existed in real time? That would be nuts. That means if the Savage Dragon movie were successful enough to justify sequels, there is a ton of fertile territory to dig through. Unlike, say, Spider-Man or Batman that feel like they have the same basic plot every other movie with a different director or actor at the helm. It also means that, even if Dragon himself has died and been resurrected multiple times, no one else is safe. There are no sacred cows in these comics (unless actual cows are the bad guys). It's often said that Batman, Spider-Man and Flash have the greatest collection of rogues in the superhero business, and that the Justice League or Avengers include all the greatest heroes in their respective universes, but all of those characters are nothing compared to the cast of Savage Dragon. Larsen's been working on theses characters since he was a kid, and he continues to cycle out old characters and filter in new ones every issue. There's the little dude that looks like a child's doll but conquered multiple planets (including Earth), the evil scientist with head-dentata, the strongest guy in the universe with the mind of a toddler, the baby girl that become's Earth's mightiest man whenever her wrists touch, the radio DJ that fires feces cannons out of his arms (and by the way, turned living crap into his own daughters), and... did I already mention the chicken man? Oh, and God has shown up a few times. Hell, even the one-off characters are cool. Turf seems like the kind of character that would take up one-third of your average Spider-Man movie, yet he only made a couple of appearances. Larsen isn't afraid to kill-off distinctive or fan-favorite characters because he always has more ready to cause trouble. Plus, the comic recently incorporated dozens and dozens of public domain superheroes. Heck, that's not even counting the well-rounded human cast that take up the bulk of Dragon's time. Guardians of the Galaxy proved an unorthodox, less-read comic with a crazy sense of humor and a grand scope could make it in the movies. Savage Dragon could be just the off-the-radar movie to hit it off with audiences. Still, it needs a lot of things. The right cast, a director with vision, producers willing to take a gamble. This film could be a long way from being realized, but who knows, miracles could happen. As a personal aside, years ago I interviewed Guillermo del Toro (in his pajamas - long story), and after talking to him about Hellboy, I asked if he'd ever consider Savage Dragon. To my chagrin, he said "no" because it's "too similar to Hellboy." And that's too bad because while the solid-color, muscle-bound monster-fighter might seem similar on the surface, that's where the similarities end. Bummer, he could've made a great Dragon movie. Now, all that said, who should make this film a reality?